Repairs dents, dings, holes, and scratches. Finish repair the same day. 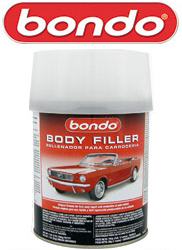 cures fast for a durable permanent body repair for metal, wood, steel, aluminum, and fiberglass. Sands in 20 minutes. One Quart and a cream hardener is included.